Businesses across many different industries, spread across the state of Nebraska, depend on industry leading material handling equipment from Copperloy. In addition to the great selection of loading dock equipment we offer, we also have a state of the art 70,000 sq. ft. custom steel fabrication facility. Our facility is ready to provide you with a special, custom-made solution. Copperloy is one of the leading choices for yard ramps in Nebraska. We’re ready to help you and your business get the job done. We also have used ramps and rentals. Mobile and portable ramps, forklift ramps, truck ramps, dock-to-ground ramps, portable platforms, and more. Choose between steel or aluminum, along with various heights, lengths, widths, and weight capacities. Feature rich products with side curbs, deck grating, level offs, lips, pneumatic tires, positioning sleeves, and more. 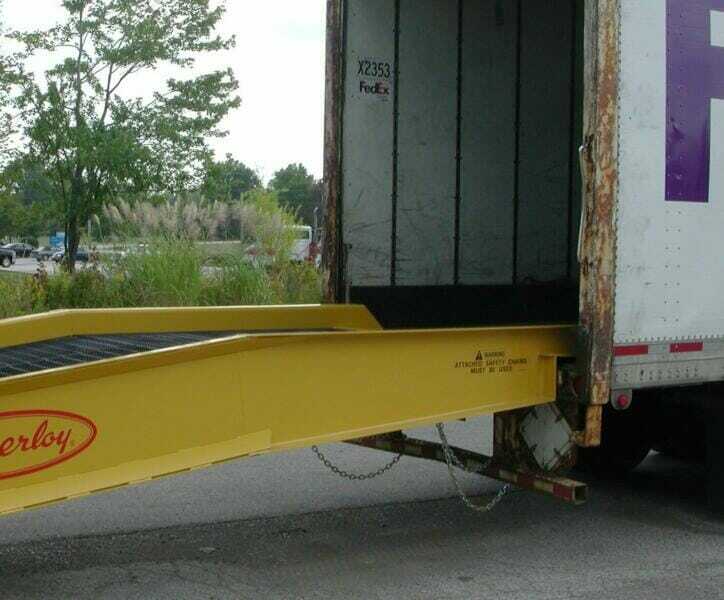 Additional loading dock equipment such as edge of dock levelers, dock boards, rail boards, etc. With our large distribution network, Copperloy’s products are always accessible to you and your company. From Omaha, Bellevue, Lincoln, and to each corner of the state, we offer affordable, speedy delivery. Contact Copperloy by calling us at 800-321-4968. We’ll help you get started and show you more about why we’re the leading choice for Nebraska yard ramps.